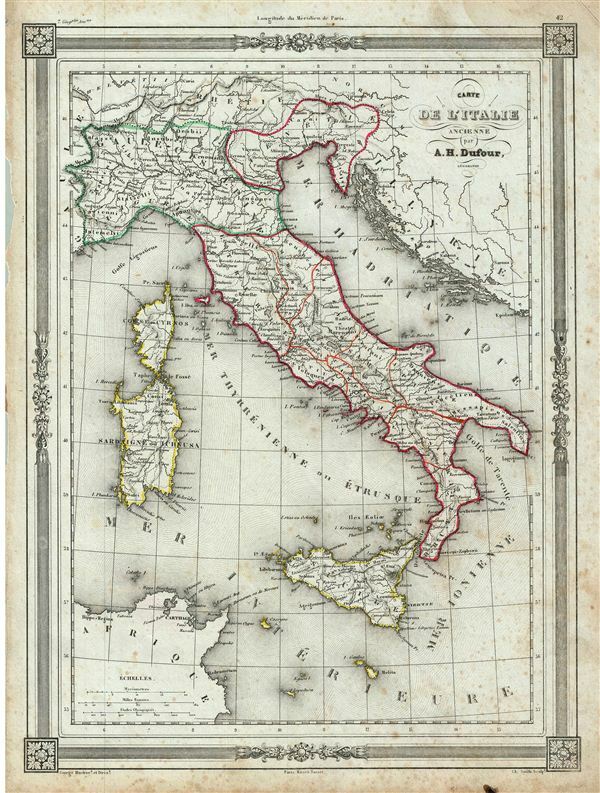 An uncommon and extremely attractive 1852 map of Italy during ancient Roman times. The map coves from Cisalpine Gaul to Sicily. Also includes the islands of Corsica and Sardinia. Throughout, the map identifies various cities, towns, rivers and assortment of additional topographical details. During the first centuries of the Imperial Rome, Italia was the territory of the city of Rome rather than a Roman Province. As such Italia enjoyed a special status such that the armies of military commanders were not allowed into the region. The map features a beautiful frame style border. Prepared by A. H. Dufour for publication as plate no. 42 in Maison Basset's 1852 edition of Atlas Illustre Destine a l'enseignement de la Geographie elementaire.